Beside Gold. – which I covered in my previous post – there is another short film I did that is set in a desert. Its name sounds very strange: Zzyzx (pronounced: Zy-Zacks, it rhymes with “Isaac’s”, according to the person who came up with the name). What is the background of this small short film with its found footage look that’s so different from the more experimental Gold.? In December 2011, I did my second roadtrip from Las Vegas to Los Angeles, together with my friend Jarek Zabczynski whom I had met in July at Las Vegas Film Festival. This roadtrip was very spontaneous: I had flown to Las Vegas (via Los Angeles) for the Nevada premiere of my feature Menschenliebe, and was supposed to fly back to LA for the Hollywood premiere of the same film. (2011 was an intense year for me, when Menschenliebe screened so many times in the US… That year I met a lot of people who ended up becoming some of my closest friends, including R. from the previous post, and Miles Hunter whom I mentioned in the very first post in this blog). In Las Vegas, I met Jarek, and we spontaneously decided to take his car to Los Angeles. I always associate wonderful drives and interesting conversations with the desert, and this was no exception. Jarek is a very cool guy, and we had some fun, deep and insightful conversations along the way – I really hope we do this again rather sooner than later. 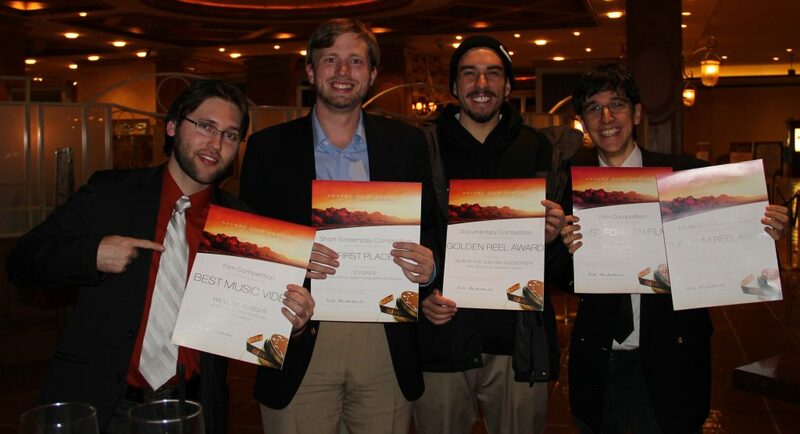 Award winners at Nevada Film Festival, December 4, 2011. Jarek, Kerry, Phil and I (from left to right). I get nostalgic thinking about the fun the four of us had, exploring Las Vegas together that night, it was an adventure in its own right. On our way, he told me of a sign he always had noticed along the highway: Zzyzx road. We passed it once, and then decided to drive back to see what’s at the end of that roadway. Neither of us had any idea what lay ahead, and we didn’t think of consulting the internet on his smartphone – so it felt like a true adventure. I was excited: My first desert adventure – and who knows what we would find? To document it, I filmed it – and that’s the footage that ended up in the short film. We drove through salt flats (that seemed like an alien landscape to me at first!) and finally encountered some houses in Zzyzx. They seemed abandoned and creepy, and we had no idea what was going on there. While filming, I already noticed that this looks very much like some kind of found footage horror film. Jarek played along and commented the surroundings, while I was giggling behind the camera. (editing out my giggles from the audio actually took a bit of effort editing the short film!) 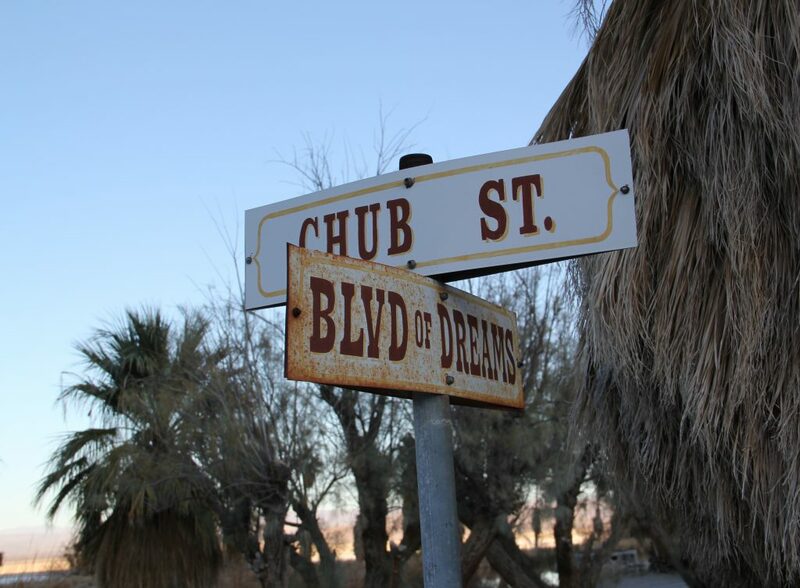 The place Zzyzx had been constructed by radio evangelist Curtis Howe Springer in the 1940s, and he had been running it until the 70s as a kind of health spa (selling special “Antideluvian Tea” and other quack medicine), until he was evicted as he didn’t own the land. Today, it’s housing the “Desert Studies Center” that does some very interesting research and offers courses that sound pretty exciting to students. But when we were there, the place seemed empty, probably we had stumbled upon it on a particularly quiet day. Despite the activities of the “Desert Studies Center”, a few of Springer’s old buildings are decaying and not in use, giving some parts a slightly eerie atmosphere. 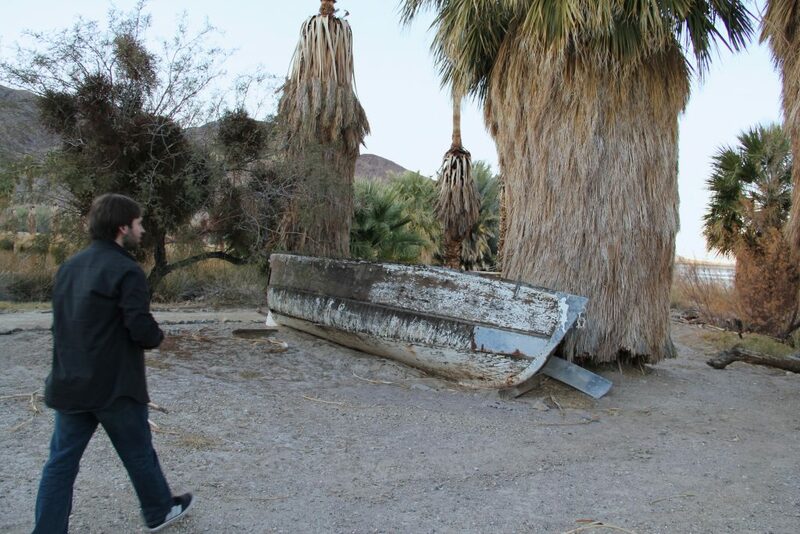 Jarek exploring Zzyzx as I photograph him… Next to a small lake, there was an old, abandoned boat, that seemed quite out of place and strange… I hope to one day go back to Zzyzx to ask people working there about its history. After we were done exploring, we continued our drive. That December in Los Angeles was an incredibly, exciting month, and when returning to Germany, I didn’t really think about the vacation video footage from Zzyzx much: I transferred it on my hard drive and then continued working on my feature film Break-Up. Over the years, I occasionally remembered it, but never found much time for it… Fast forward to September 2016. I had a free afternoon, remembered the footage, and thought I should try edit a little suspenseful quasi-trailer from it. After deciding to do so, editing the final film took about three hours, including color correction to make the images appear more moody, and sound design (that is partially borrowed from the interrogation scene in my feature Timeless). I was very happy how this short film – made from our fun vacation video – turned out, and submitted it to film festivals… And was surprised and honored when it was chosen to screen at Szczecin International Film Festival in Poland in October 2015, where it received a wonderful reception from the audience. 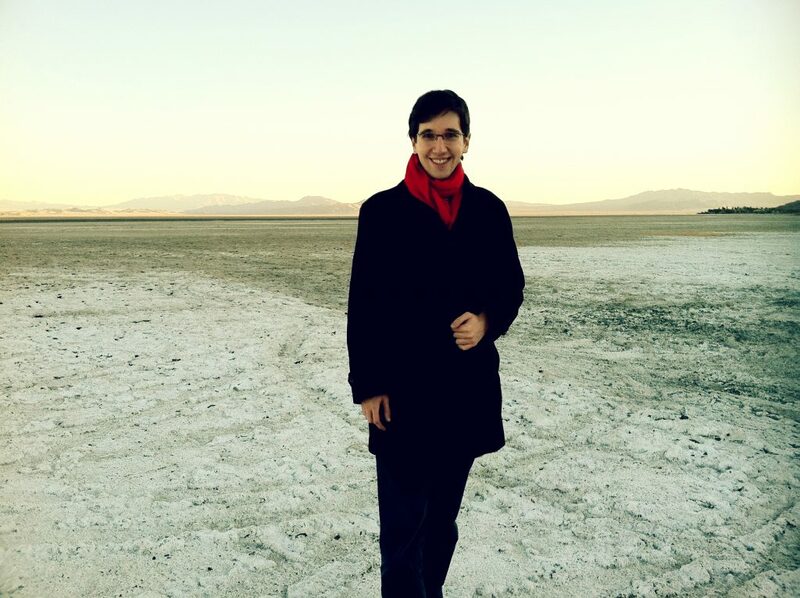 Next to a salt flat in Mojave Desert on December 4, 2011, during our Zzyzx adventure. Picture by Jarek Zabczynski. “Fun fact”: The coat is the same that I wore in my film “Menschenliebe”, filmed in 2009. This entry was posted in Film, Short Film, Travel and tagged Anecdote, California, Desert, Zzyzx on November 10, 2016 by Alexander_Tuschinski.